At first blush, the notion of a mechanical robot giving birth to a baby sounds preposterous. But many of the technologies we use today started out as preposterous ideas at one time or another. Every year we cross boundaries that never seemed crossable, entertain theories that seemed ludicrous a decade earlier, and create industries that were considered science fiction when we were growing up. Naturally, you’re probably questioning the use of the term “robot” for something that is a living, breathing organic life form. So let’s start with the definition. ROBOT ˈrōˌbät,ˈrōbət/ – noun – (especially in science fiction) A machine resembling a human being and able to replicate certain human movements and functions automatically. Most of us have a preconceived notion of what a robot is and how it should act, but even our dictionaries leave the specifics far more open ended. Over time, our thinking about mechanical machines will evolve from purely mechanical devices, to hybrid mechanical-organic contraptions, to mostly living machines, to pure synthetic life forms, and the process of building machines will be replaced by growing them. During this time, artificial intelligence will be replaced by degrees of synthetic intelligence, followed by what many will consider a superior form of “real” intelligence. In much the same way a living culture of sourdough is passed from one generation to the next, the living intelligence of one bot will be “birthed” into each new generation, building upon what it already knows, exhibiting the same characteristics of humans, living, breathing, and growing from baby bots into biomimetic versions of ourselves, only with far fewer flaws… hopefully. But that’s where things get messy. Over time the debate over the philosophical underpinnings of our “humanness,” and whether humans are superior to synthetic life forms will surface time and again with many arguing that our so-called human flaws are indeed necessary components of higher order emotions like compassion and empathy. The word “biot,” a clever descriptor meaning “biological robot”, was originally coined by Arthur C. Clarke in his 1972 novel Rendezvous with Rama. In the novel, biots are depicted as artificial biological organisms created to perform specific tasks in space. I won’t go into all the nuances that differentiate each of these fields, only that the hard, fast boundaries between organic and inorganic, biological engineering and biomechanical engineering, and artificial life and real life are all beginning to blur. Last year molecules became machines when the Nobel Prize in chemistry went to Jean-Pierre Sauvage, Sir J. Fraser Stoddart and Bernard Feringa who figured out how to combine atoms to make nanoscale machines that can act like motors, elevators, muscles and even a rudimentary car with four “wheels.” Their creations are so small that they’re about 1,000 times narrower than a human hair. We are using 3D printers to print with human tissue, stem cells, and even artificial blood cells. Other 3D fabrication machines are able to print bone, cartilage, muscle, teeth, organs, blood vessels, and even ears. Ironically, it seems like only a matter of time before we adopt the “Mr. Potato Head” approach to replacing body parts. The science of cloning first entered the public lexicon in 1996 with the cloning of Dolly the sheep. Since then dozens of different species have been cloned including camels, dogs, deer, horses, monkeys, cows, frogs, rabbits, and many more. Human cloning has long been discussed as a natural extension of the animal research, promising an exact genetic copy of any person. For a more technical explanation, there are three different types of artificial cloning: gene cloning, reproductive cloning and therapeutic cloning. Gene cloning produces copies of genes or segments of DNA. Reproductive cloning produces copies of whole animals. Therapeutic cloning produces embryonic stem cells for experiments aimed at creating tissues to replace injured or diseased tissues. Researchers routinely use cloning techniques to make copies of genes that they wish to study like bacteria, yeast cells, viruses, or plasmids. Despite several highly publicized reports, human cloning still appears to be fiction. There currently is no solid scientific evidence that anyone has actually cloned a human embryo. Synthetic biology involves the fabrication of biological systems through engineering disciplines. Synthetic biology originated from converging forces in chemistry, biology, computer science, and engineering. Think of it as a biology-based “toolkit” that uses algorithms and automated processes to change how we build, control, and repair biological systems. Over time, synthetic biology will enable us to program DNA to produce tailor-made foods, fuels, and vaccines. Combining cloning with cybernetics, biorobotics, and synthetic biology and we begin to understand the basis for fabricated life forms that can reproduce. 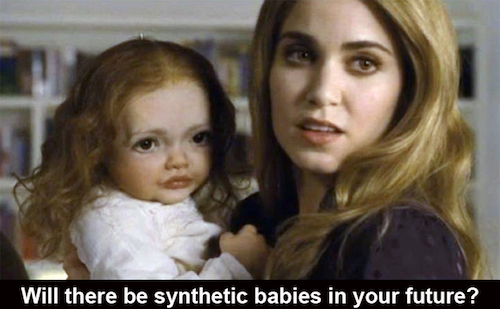 All we’re missing is our ability to synthesize our reproductive organs. Emanuel Greenberg patented the first artificial womb over 60 years ago in 1955. In the mid 1990s, Japanese researchers succeeded in incubating goat fetuses for weeks in a machine containing artificial amniotic fluid. Recent advancements in neonatal intensive care have pushed back the minimum gestational age for human fetuses to survive to less than 22 weeks. That’s only a little more than halfway through a normal 40-week pregnancy. The technology isn’t nearly as outrageous as it first sounds. An artificial uterus, as a replacement organ, could have many potential applications. As example, if a fetus was moved from a natural uterus to an artificial one with extended functions, doctors could treat a number of conditions independent of the mother’s situation such as her being sick or in an accident, and even raises prospects for conducting certain kinds of fetal surgery at an earlier stage instead of having to postponing until after birth. Last year, scientists at Cambridge University conducted a series of tests to grow human embryos for a full 14-day duration inside a petri dish, the ethical limit for this type of research imposed by an association of 17 nations. Each day of growth gave researchers the ability to study both the physical and genetic changes that occurred in the developing embryo. Study author Marta Shahbazi was surprised to see that a human embryo could direct its own development, even after it reached the point where it should have implanted into the uterus, without any direction from the mother. Naturally this begs the question of whether an artificial womb, if it had the right ingredients, would be capable of bringing a developing human to term? It also creates tons of questions about all the conditions necessary for producing a functional human being, even though we are hard-pressed to explain what a functional human actually is. Since doing this research with real human embryos is deemed taboo, experimenting on artificial embryos or synthetic embryos is an obvious direction since they don’t carry the same stigma. Is a robot babysitter a more likely scenario? With this brief overview of some of the latest advancements, the idea of a robot giving birth to a baby, either a baby human or a baby robot no longer seems so far fetched. Just as controlling weather, gravity, and time have long been theoretical sciences that have moved from science fiction to science possibilities, the idea of robots birthing robots is moving into a similar realm of viability. First a disclaimer. Even though I write about topics that often make us uncomfortable, it doesn’t mean I’m giving my seal of approval to them. We’re still a long ways from understanding the full implications of something like this. As a messenger of the future, it’s important for me to begin the very early stage conversations so a well-informed public can make well-informed decisions. While I don’t see this happening in any viable fashion for several decades, there’s always an off chance of key researchers being light-years ahead of the pack, perhaps ones developing synthetic spiderbots that give birth to baby spiderbots, much sooner than expected. But that doesn’t change the fact that they’re coming.